Production on Jurassic World 2 is nearly coming to a close. Filming is expected to wrap this week on the fifth installment of the Jurassic Park franchise, but it looks like a few surprises are still coming our way before production finishes up. We've known for some time that this movie is going to feature a lot more practical dinosaur effects than the first Jurassic World and these new set photos are proof of that. For fans of the original Jurassic Park, this is probably about as big as it gets because a fan-favorite dinosaur is making her triumphant return. Warning: possible spoilers ahead for Jurassic World 2. A while back, writer/producer Colin Trevorrow revealed that the original Jurassic Park T-rex, which many fans have taken to calling Rexy over the years, is going to be appearing in Jurassic World: Fallen Kingdom. Thanks to these new set photos from JurassicWorld2Movie.com, we know that Rexy is going to be an actual, practical dinosaur as opposed to purely CGI. Seeing Rexy return in Jurassic World was nice, but seeing her in her animatronic form will be a real treat. As we can see in the set photos, Rexy is being hauled around in a massive cage, much like the one seen in The Lost World: Jurassic Park. It is quite possible that these cages are just being used to transport the massive props for shooting, but it is also possible that they will actually play into the story. Are we going to see Rexy being captured for some reason in Jurassic World 2? Given that we've heard the movie is possibly going to involve some big rescue mission, humans saving dinos this time around, it could be for the safety of the dinosaurs and not some form of cruelty. The poster for Jurassic World: Fallen Kingdom also featured some red embers and, since we've heard there could be a volcanic eruption on Isla Nublar, or possibly a military firebombing, that could be why the dinosaurs need to be caged up and transported. We also received some photographic evidence a few weeks back that /jurassic-world-2-indominus-rex-promo-art/Indominus Rex is returning despite her fateful turn at the end of Jurassic World. Even if it is just to move the giant animatronic dinosaurs around, it is nice to see the practical T-rex prop back in action. That is part of what makes Jurassic Park hold up as well as it does today. 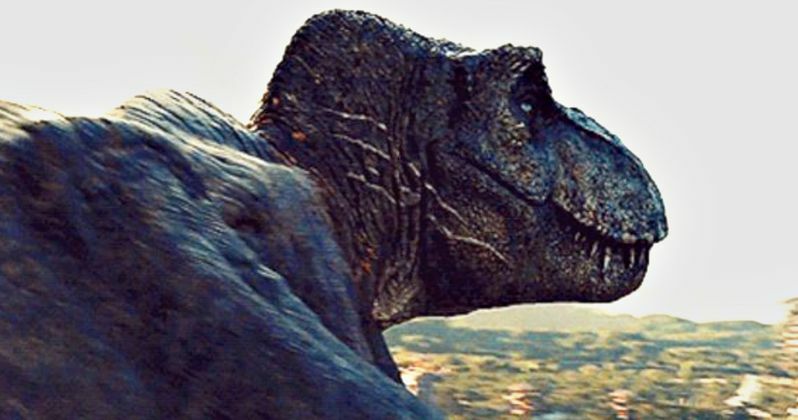 Unfortunately, until we get some official plot details, it'll be hard to speculate how much screen time Rexy will get or if this cage is actually going to play some role in the movie. Either way, this might be the best set photo we've seen from Jurassic World 2 so far. Director J.A. Bayona is putting his money where his mouth is with these practical dino effects. Let's just hope the movie lives up to the hype next year. With shooting about to wrap and San Diego Comic-Con just around the corner, we should be at least getting some plot details, if not a teaser trailer, very soon. So keep your eyes peeled. In the meantime, be sure to check out the new set photos from Jurassic World: Fallen Kingdom for yourself below.